At some point in the journey to overcome anxiety issues, concepts and techniques and tips and tricks fall by the wayside and it becomes a matter of desire and drive and courage and just wanting to improve your life. You can read and listen and learn and discuss, but at some point you have to find that spark deep in your gut and get moving. In this episode Billy and I talk about finding your spark and using it to launch you forward. Join our Facebook discussion group and get involved in the dialogue! I’ve been asked many times over the years how bad my anxiety used to be. Yes, it was probably as bad as yours. In this episode of our Anxiety 101 series, I’ll tell you all about it. Everything I’ve been through. The symptoms I’ve dealt with. The issues I’ve had to resolve. The good news is that if I can do it, you can do it! Questions? Comments? Lets hear them. Find me on Facebook, Twitter and YouTube! Anxiety 101 – Episode 16 – What Triggers Your Anxiety? What triggers your anxiety? Billy and I discuss anxiety triggers, how you can identify your triggers, and what you can do about them. As usual, we answer listener/viewer questions near the end of the episode. Apologies for the audio issues on my end of the feed. New camera and mic setup had some issues that needed to be sorted out. 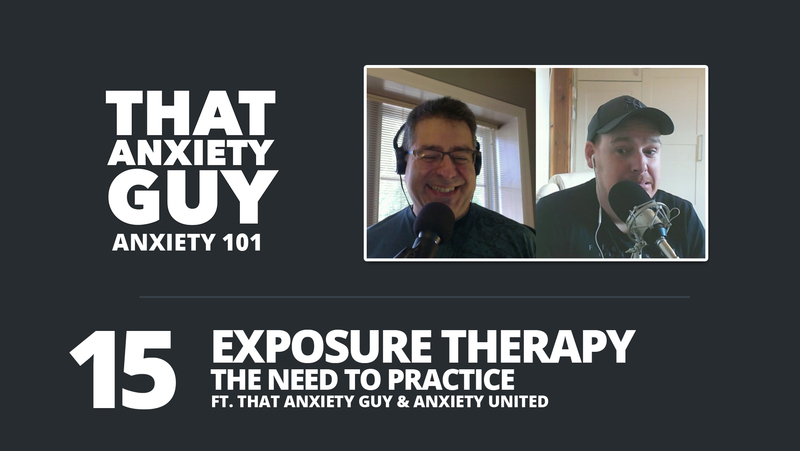 Following up on our initial talk about the basics of exposure therapy, Billy and talk about how repetition and practice are so important. We discuss how practicing the small things and continually expanding your scope will make it easy to tackle larger tasks that are harder to practice (i.e. flying, or visiting the dentist). Finally, we take some comments and questions on previous episodes. Billy and I were both a bit under the weather for this episode, so we thought a discussion of health anxiety and how illness impacts your anxiety was in order. We discuss health anxiety in general, our reactions when feeling ill, and how dealing with health anxiety is more about cognitive work than physical exposure. Find me on Facebook, YouTube and Twitter.